Corey Crawford's mysterious "lower-body" injury turned out to be a fairly hilarious one—the Blackhawks goalie says he missed a step and fell down while leaving a concert. Coach Joel Quenneville said Crawford, who wore a walking boot when he met the media today, will be out two to three weeks. "I was at a concert the other day and was on the way out and missed a step and I didn't think it was that bad," Crawford said. "I woke up the next day and it was worse than I thought. "I'm pretty embarrassed about it, frustrated." Crawford refused to give any more details about the incident, including whether alcohol was involved. 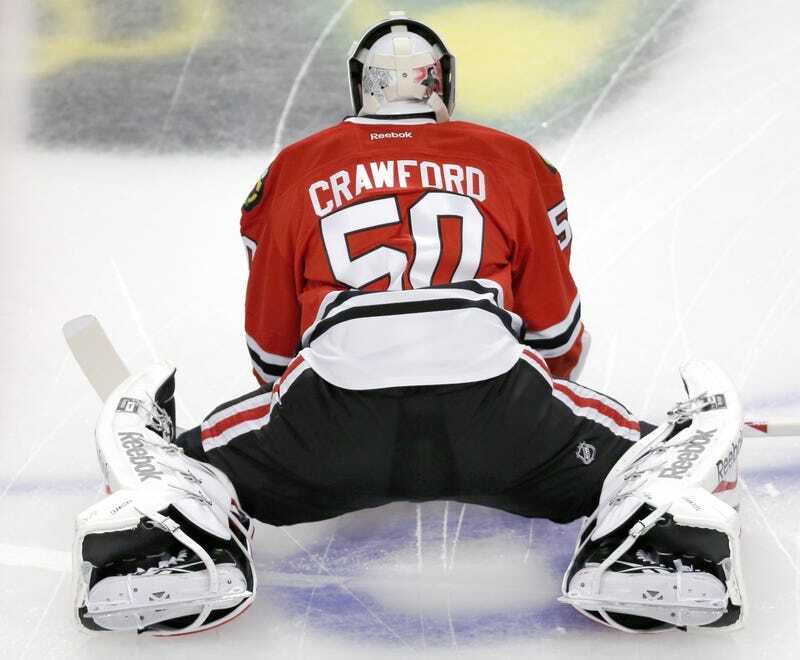 Scuttlebutt on the internet says Crawford was at the Rise Against show at Chicago's House of Blues on Monday night. There is no acceptable reason to see Rise Against unless you're just there to get blindingly drunk. So.